Who, despite her strong desire to climb everything, does not enjoy being referred to as my monkey girl. Personally, if she didn't do things like climb the outside of the stairway or you know, jump off the second floor balcony and break her legs, I likely wouldn't call her my monkey. Either way, Little Miss Monkey has a ham & cheese sandwich on the last of the tomato basil rolls we bought at Kroger (very very good rolls). The monkey pick helps hold it all together. 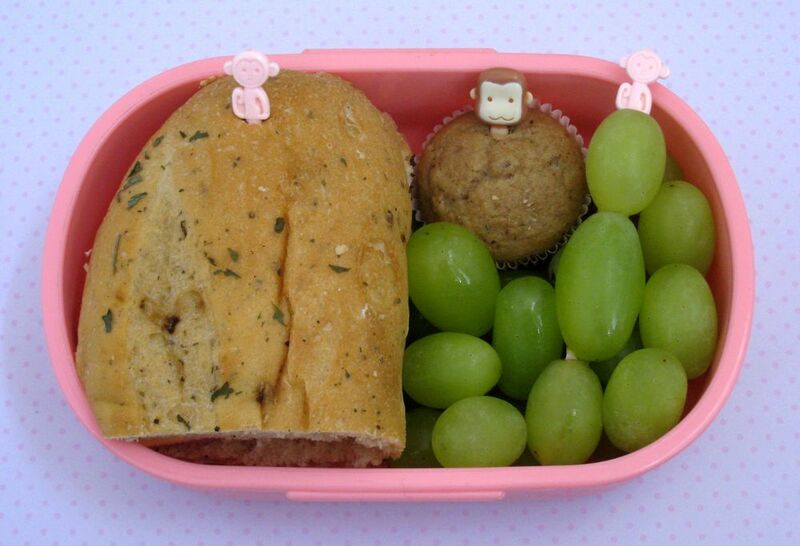 She also has grapes with another monkey pick and a banana muffin, with one more monkey in it. Trying to finish out some things we already had made, so a little less creative, but we can make some new stuff now. Hey hiii, First time dropping by and am new into bento. Trying to learn from all of you, bento lovers hehe.. oh yea, have grab your button into my blog :) and also following u .. nice blog!